Alex Hern follows up yesterday’s economics round-up with another day of bad news. This time the OECD and Fitch have joined in, both predicting a slow-down. There’s not going to be much christmas cheer in number 11 today, as the OECD has cut its growth prediction for the UK for the eighth month running. This follows the news yesterday that economists at the bank Standard Chartered were prediction a contraction of 1.3 per cent of GDP in the first half of 2012, and comes on the same day that the ratings agency Fitch downgraded UK forecasts from 1.2 per cent growth to just 0.7 per cent. Rather than making concrete predictions about the magnitude of growth, the OECD uses an index of “composite leading indicators” (CLI), which tend to exhibit trends around six months in advance of the economy moving in the same direction. A CLI of over 100 implies that growth will rise above the long-term trend, and under 100 means that it will drop below. The further above or below 100 it is, the surer that rise or fall is to happen. Since the long-term trend is itself so low, there’s not far for growth to drop before it becomes contraction, and the numbers aren’t looking so good. The OECD area as a whole has a CLI of 100.1, and the eurozone is on 98.5. Alarmingly, the UK is just a tenth of a point above the eurozone indicator, at 98.6, which implies that our fiscal isolation hasn’t kept us much safer that the extremely exposed economies of France (98.1) and Germany (98.3). The compilation of the OECD’s figures is likely too early to fully take into account the effects of Cameron’s not-quite-veto on Friday. For that, we shall have to wait until the release of the January index. As we reported yesterday, any further cut in predicted growth will have large ramifications. Even the official figures, which still predict some growth, were bad enough to require an admission in the autumn statement that the deficit would not be cut in the lifetime of this parliament. Under the 2010 OBR projection, the deficit would have shrunk to £37 billion by 2014/15, but by the 2011 projection, it will still be £79 billion – and this is a projection which still assumes uninterrupted growth, rising to almost three per cent by 2014. If the UK really does go back into recession between now and then, and if it does stagnate as much as is predicted in the aftermath, the prudence of deficit reduction as a primary aim may have to be called into question. The one piece of good economic news today is that the rate of inflation appears to be falling from its highs in October, as Tony Dolphin reports below. 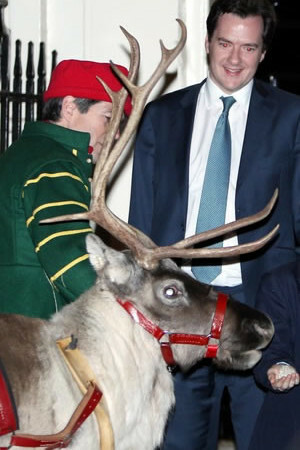 As christmas presents go, however, Osborne may be feeling hard done by. OK so here’s a radical thought for you all to mull over during Christmas. How about getting out of Europe and using just half the subscriptions currently running @£50million a day to finance youth enterprise schemes such as apprenticeships whilst also setting up a loan fund to allow businesses to lend directly from government to enhance their business and create more jobs. The bankers have had things far too easy as they have been “GIVEN” X billions in quantitative easing to shore up their bonus pots lets now call in the debts or at least re-negotiate the terms of interest. Give every British born household £10,000 January bonus to with as they wish which will stimulate the economy whilst driving down some of the personal debt meaning bankers will have to work a little bit harder to get their money. Raise the tax threshold to £12,000 PA and lower the maximum to 40% I know a lot of you will say but that gives the rich more money “SO WHAT!” all attempts at getting this coalition condemnation to re-distribute the share of the burden will fall on deaf ears as “THEY” are all in it together. Give us back democracy by removing the vile corruption yoke of the EU whose desire for a federalist state of Europe has been driven ever faster by the actions of Cameron anyway.